Reality Check: How much would Trident replacement cost? The future of the UK's nuclear deterrent Trident has hit the election news headlines with the Tory commitment to build four new nuclear missile-armed submarines. So, what costs are involved when it comes to renewing the defence system? It's no surprise that Trident nuclear weapons have become a big issue in the campaign. Opposing nuclear weapons is an article of faith in the SNP. And Labour has a memory of being hounded by Conservatives in the 1983 general elections, when it argued against having a nuclear deterrent. That was at the time that the Trident system was being built, replacing Polaris. The next term of the Westminster parliament will face a decision on whether Trident is renewed with new submarines and missiles. The four current Trident-armed Vanguard Class submarines are due to retire by 2028. The missiles on them are having their operational lives extended to 2042. Work has already begun on submarine design, but the big decision is yet to come. Leaving the politics and the military strategy for politicians to debate, what about the cost? The Ministry of Defence (MoD) has said it will cost £17.5bn to £23.4bn to procure the replacement system. That is the estimate at 2013-14 prices. Of that, between £12.9bn and £16.4bn would be spent on the submarines themselves. And it is assumed that the submarines would be built in the specialist yard at Barrow in Cumbria, where they built their first sub in 1886, for the navy of the Ottoman Empire. 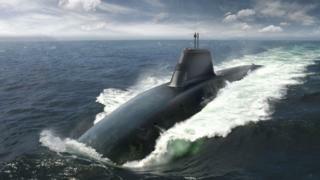 Last year, it was granted £300m for an upgrade, allowing it to build larger submarines than before. The work that's been done on the Successor class submarines already runs into billions. The concept phase cost £854m, beginning in 2007. It is being followed by the assessment phase, with a budget of £3.3bn, of which £1.2bn had been spent a year ago. That buys steel with which to start construction and early work at Rolls-Royce in Derby on building new engines. Such big MoD procurement programmes are notorious for going over-budget. The total estimate in 2006 was £15bn to £20bn. So how do critics of nuclear weapons get to a total figure of £100bn? That includes the cost of running and servicing the submarines over a projected 40-year lifespan. The Campaign for Nuclear Disarmament (CND) has arrived at the round £100bn figure by two routes. One is to take the MoD's stated intention to spend 5-6% of its defence budget on running its nuclear deterrent. CND estimates that at £2bn to £2.4bn per year, and multiplies by 40 - though, of course, defence budgets can go up or come down. The different approach is a breakdown of costs. CND estimates £57bn in running costs, plus £13bn to decommission the submarines and weapons in the 2060s. Add to that the upper end of estimates for building the submarines, at £26bn, and another £1bn for conventional military forces to protect them. CND also adds more than £3bn for the cost of upgrading nuclear warheads and then replacing them in the 2030s. That amount is disputed, because the MoD says the warhead and missile replacement costs are included in its overall procurement budget. and an unusable throw-back to a past Cold War mentality. The MoD says the Faslane and Coulport bases on the Clyde have about 3,500 uniformed Royal Navy personnel, 1,700 contractors and 1,600 other civilian employees. Of those, around 500 civilians are exclusively linked to the nuclear work, while the number is rising as other submarines, without nuclear weapons, have their bases moved to the Clyde. At the Barrow-in Furness boatyard, there are more than 5,000 people employed by BAE Systems, and it is expected that an additional 1,000 would be taken on if the main "gateway" decision on the Successor class is made in 2016. Is employment a reason for building the next generation of nuclear-armed sub? Not according to one Liberal Democrat minister, who said in 2012 that the government would be better spending the money on re-locating the workforce to the Bahamas. What's the truth behind the politicians' claims on the campaign trail? Our experts investigate the facts, and wider stories, behind the soundbites.